On the 15th of April 1912, a major and historic disaster occurred. The Titanic sunk killing roughly around 1,500 people. The unsinkable ship turned out to be not so unsinkable after all. The National Maritime Museum in Falmouth, have started an exhibit about the disaster called the ‘Titanic Stories’. It started on the 8th of March, and will end on the 7th of January. The sinking of the Titanic was one of the most famous disasters in history. It made all the newspapers globally after it sunk. A few headlines were: Worst Ocean Disaster in World’s History; Titanic Goes down; 1,341 lives are lost (New York Advocate). Titanic inquiry goes on; loss of 1,595 lives due to speed mania (The Globe). The whole world is shocked by the greatest marine catastrophe in history (The Morning Chronicle). The White Star line commissioned the ship, and they started construction on the 31st of March 1909, finishing on the 31st of March 1912. On the 10th of April, 1912 the historic ship set sail for its first voyage. There was a lot of media attention attached to the Titanic as it was meant to be a feat in modern engineering, it being so called ‘unsinkable’. The main designer for the ship was Thomas Andrews, who famously said before the trip: “Not even God could sink this ship”. Sadly, he died on the ship, as well as its Captain, Edward John Smith. On that night (14th of April 1912), the ship received telegrams from other boats in the area about icebergs nearby. This information didn’t worry the crew as they made their way across the freezing ocean. As apart from that, the sea and the weather was perfect…but very cold. One of the crew members told the Captain about the temperature, and Captain Smith told him to slow the boat if it becomes hazy, and to at once send a message to the crow’s nest to look out for icebergs. Since Jack Philips was tired and over worked he just said: “Shut up! Shut Up! I am busy”. At 11:40pm the iceberg that would sink them was spotted up ahead, in mass it was almost ten times bigger than the Titanic. At that time the iceberg struck the starboard side of the ship, around midnight the crew told Captain Smith that the boat would sink in a few hours. The rest unfortunately is history, since there weren’t enough life boats on the ship (why do you need enough lifeboats for an unsinkable ship?). The passengers (mainly women and children as their lives were given priority), were on the ships. Some were barely filled, others to the rafters, with parents throwing their babies on the boats to save them. The number of survivors were only 706, as they only had 20 lifeboats on board – much less than what was needed. They were picked up by the Carpathia, and taken to safety. After that an inquest was heard with the surviving crew testifying about what happened on the Titanic. The exhibit is well worth going to. It is very detailed with a range of objects and information covering the disaster, personal stories attached to the people involved, Titanic memorabilia (cups, music, board games…etc. ), Movies involving the Titanic and costumes from those films. It even had a replica lifeboat there, and at the top of the exhibit is a formation of what the iceberg was like. There was a clever infographic on one of the walls that showed how many passengers lived and survived by color shading and figures of men, women and children. They were all grouped by class or if they were a member of the crew. If is was a light colour then they survived, if a darker shade they died. Newspaper headlines of the sinking lined a wall, showing just how much the disaster shocked the world. It also showed the human side, by dedicating wall to the musicians who ‘went down with the ship’. As well as some of the life jackets that were used in the terrible disaster. 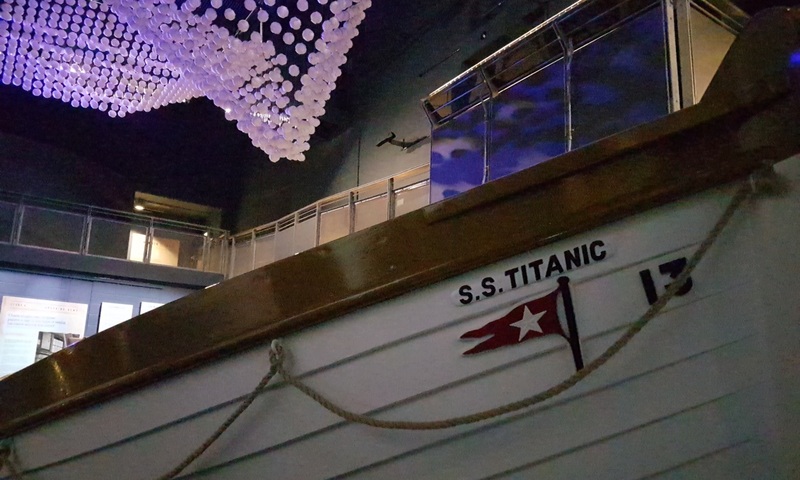 It went through the history and displayed a range of objects that have anything to do with the Titanic. For people who love the movie ‘Titanic- 1997’, they have two outfits that the actress playing Rose wore in the film, as well as a few stills from it, and a few objects (including the jewel-‘the heart of the ocean’. A well as things from the real Titanic that sold well (i.e. a letter from one of the passengers). It also covered the rediscovering of the ship in 1985, and some footage of the Titanic down below. This exhibit is truly worth going to, it’s informative, interesting and with great range of objects. Adults go for £13.50, under 18s- £6:00 and under 5s go for free. Although if you pay once, you get in for free for the whole year.